Christ’s redemptive grace unites people, so it’s worth considering what a Christian home should be. Family is a central font of co-redemption in any society, since it always overflows to other families and people around it. The marriage covenant unites a man and woman in a deep and personal way, and the children coming from their union should benefit from their mutual love and commitment. But many families today have been broken by divorce, misunderstandings and alienation. Often religious and moral differences create real divisions within the home; for instance, if a family member stops going to Church or begins to question the faith; or if a son or daughter marries outside of the Church, or leaves the practice of the faith. Or perhaps a parent is often absent because of work or has an addiction that separates him or her from the family. Family unity also suffers from too many activities outside of the home — to such an extent that the family hardly has time to eat a meal together or attend Church together, or parents become their children’s chauffeurs. In all of these ways, families can become a group of strangers living under one roof. In such circumstances, the redemption of the family depends on understanding and God’s grace. If parents are consistent in their beliefs, if they educate their children in the faith and with mutual love and service, if they know how to suffer for Christ through the toughest moments, they will bring hope to their families — for it is the cross of the Redeemer that heals all people, including family members. The power of forgiveness, united with prayer, is a great unifier. People must learn to overcome grudges or negative reactions in order to appreciate other family members and their good qualities. Certainly attending Mass together and praying the Rosary are powerful and intimate ways to bring back a family, or to keep it united. Each family member, including the children, should feel a special obligation to love and protect the home — even though many forces in society seem to belittle or attack it. Maybe in college or at some other time you experienced the joy of a good group of friends. They might be from different races and backgrounds, but you were all involved in an activity that united you: an entertaining sport, a service project, a study session for a big exam, a camping or hiking trip. You all had the same goal, and you were united in friendship and mutual help. Christ’s redemption is like that. It unites men and women of different races, tongues and backgrounds, and it gives them the same joy and purpose to life. This is the original meaning of the word Catholic, which means “universal” — that is, for everyone and with all the means of salvation. Christ’s liberating power not only applies to individuals, but extends to the entire human race, and indeed to the whole universe. The book of Revelation describes this cosmic renewal in vivid terms in chapter 21, which describes “The New Heaven and the New Earth.” Read it for yourself, and you’ll find a treasure of thought and inspiration. 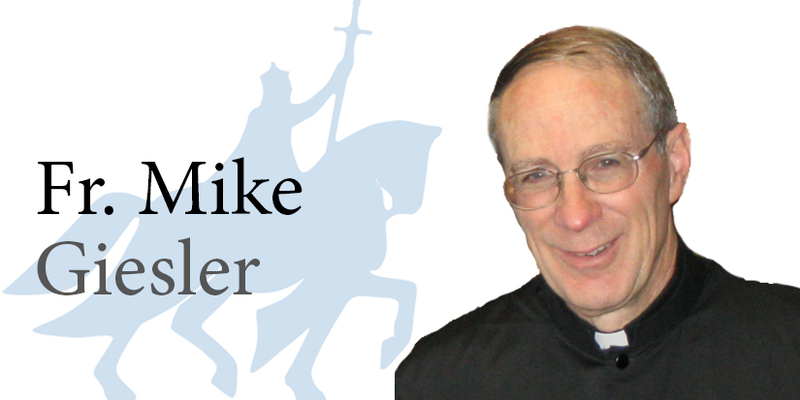 Father Giesler is a priest of Opus Dei living at the Wespine Center in St. Louis. He has written a book and several articles on Sacred Scripture and the natural law. This is the fourth of a five-part series exploring redemption.